In this issue: Ruminator chews up the scenery in downtown Reedsburg. Viroqua inventors create a movable oak tree for chillaxing cows. PHOX gets phoxier. Folk music historian Jim Leary's treasure trove. The case for author/publisher/provocateur Norb Blei. What you should know about citizen science. Wisconsin poems selected by editor JA Smith, fiction from a 2014 contest winner, book reviews of new Wisconsin titles, and more. Why has Wisconsin, which is ranked 48th in the U.S. for public arts funding, retreated from public investment in the arts? In the quest for offering limitless choice, digital marketers and programmers have enabled our retreat into a tribe of one, a singular profile to which all messages can be specifically tailored. Scultpor Karl Unaasch's "Ruminant" finds a permanent place to park in Reedsburg. A new tool for rotational grazing takes advantage of an ancient principle. Kathy Mehls is a retired high school guidance counselor from Chippewa Falls with an abiding love of birds and the outdoors. 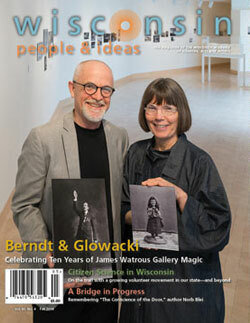 There was no way of knowing what a great success the James Watrous Gallery in Overture Center for the Arts would be when its doors opened on Sunday, September 19, in 2004. Storied Door County writer Norb Blei and his pursuit of the writer’s life. First the eyes, he thought. Watch the eyes—where are the eyes watching? Forward, searching over heads, sorting out the familiar ones ahead on the rickety gangplank? Boy meets girl. Boy gets girl. Boy and girl ride shiny new Fuji bicycles on a 2,000-mile trip from boy’s Wisconsin hometown out west in search of adventure and spiritual fulfillment. In late August of 1906, Mrs. Anna Carlton announced her intention to drown herself in the Chippewa River. Her disappearance soon after led many to believe she had followed through on her promise.